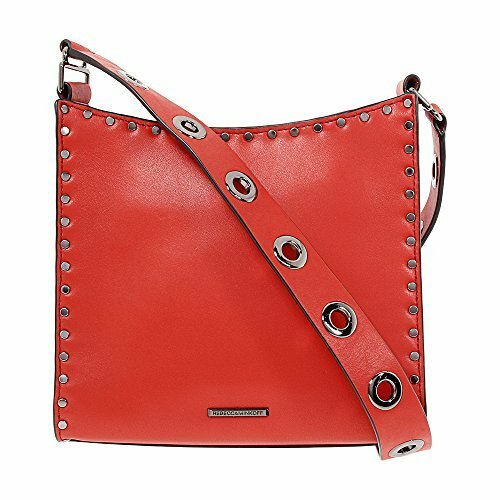 Rebecca Minkoff Midnighter Ladies Small Leather Feed Bag HSP7GMIM21 | Accessorising - Brand Name / Designer Handbags For Carry & Wear... Share If You Care! Rebecca Minkoff Midnighter Ladies Small Leather Feed Bag HSP7GMIM21. Product Dimensions: 8in (H) x 8in (L) x 2in (W). Features a top zip closure, interior slip pockets, an interior zip pocket, stud detail, and an adjustable strap. Gunmetal hardware. Small sized blood orange leather feed bag. Midnighter series.